Tobermore United manager Adrian Whiteside. Pic by Simon Robinson. 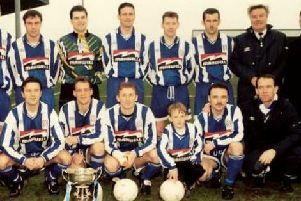 Tobermore United will return to competitive action this weekend aiming to regain momentum following 20 days of blank dates. The January 26 success against Annagh United helped to end the Portadown club’s unbeaten start to the Bluefin Sport Premier Intermediate League campaign and provided Tobermore with a significant boost. 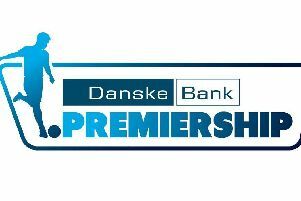 However, a run of free weekends has forced the club to focus on training sessions in advance of Saturday’s home clash with Lisburn Distillery. “We are home to Lisburn Distillery on Saturday for basically our first match in three weeks, which is ridiculous,” said Tobermore boss Adrian Whiteside. “It is very hard to keep momentum going but the lads have worked extremely hard in training. “We will be trying to hit the ground running as we know Distillery will be tough to beat. United sit third in the league standings. Fans are urged to back fundraising efforts in aid of Macmillan Cancer Support by club secretary Jonathan Black and committee member Karl Nicholl. Both - along with Colin Welsh - will be taking part in a run challenge later this year. Also, A Night At The Races has been planned for March 2.